The Punisher is a bit different from most other Marvel shows, he’s an anti-hero that’s not afraid to get his hands dirty in a fight. It’s this dirty gritty world — Marvel leaned on the FuseFX team to develop the bloodier, gorier — finer details. Read the article below. ANIMATION XPRESS – February 28, 2018 – The Punisher is a bit different from most other Marvel shows. For one, The Punisher is no typical superhero, taking on the anti-hero role for his time in the spotlight. The first season of the show was a massive hit, allowing for a Season 2 to be picked up quickly and with great expectations. 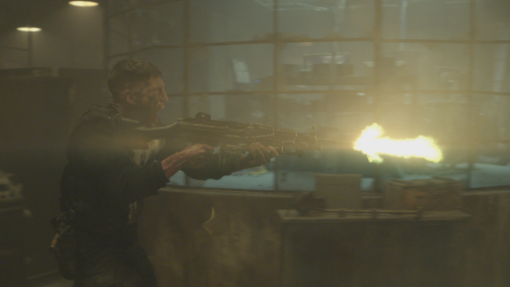 Though the show comprised of largely live-action scenes, the brutality also required the work of visual effects to bring in an extra note of realism. FuseFX was ultimately tapped for delivering over 800 shots across 13 episodes, supervised by Greg Anderson in the FuseFX NY office. For more information on the visual effects work done by the FuseFX teams, please head to the article from Animation Xpress at http://bit.ly/AnimationXpressPunisher.